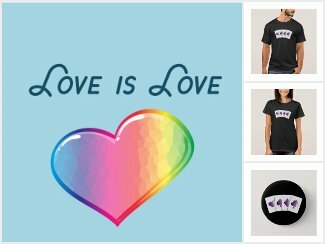 In honour of pride month I discussed with LGBT friends on some ideas and created the “Love is Love” Collection on the Zazzle Store. I took a while to post this as I was unsure about discussing my own experiences as an Asexual Panromantic which can be a pretty confusing thing to explain. https://www.asexual-aces.com/info/ is a great source for information on Aces (the term most asexuals use for themselves). However because my partner right now is a very understanding man. While I have had issues when I was a teenager of boys considering asexuality as a “challenge”, overall I’ve personally not had a lot of drama related to my sexuality. Stay safe out there during Pride events and take care of one another. Jan Zac on Spring is Finally Here! Kilian Walker on Cat Drawing!